For the record, the third generation male had the same hairstyle as well. Seen that ridiculous hairstyle? Turns out it's hereditary. Most of the time, it's an Improbable Hairstyle and often a subtrope of Anime Hair. It is also a type of Strong Family Resemblance. For a similar trope that may overlap, but deals with hair color rather than style, see Hair Color Spoiler. May be part of Generation Xerox. Usagi and her Kid from the Future Chibi-Usa both wear their hair in exaggerated odangos in Sailor Moon. So does Queen Serenity, Usagi's mother... in a past life. The parody manga Parallel Sailor Moon introduces the daughters of the four Guardian Senshi, who look exactly like their mothers (hairstyles included) and have the same names. Goku's younger son, Goten, from Dragon Ball has the same exact hair as his father, who has the same hair as his father, Bardock. Likewise, Vegeta and his father, King Vegeta, have identically ridiculous hairstyles. It also has a rare cross-gender example in Dr. Briefs, his daughter Bulma (when not permed), and her son Trunks. The Non-Serial Movie explains Goku and company's hairstyle as belonging to a particular genetic type common to Saiyans in Bardock's (original) power level, as unrelated character Turles is shown to have the exact same look as well. Yu-Gi-Oh! : Yugi's hair spikes are inherited from his grandfather, though this is less obvious until the chapter where we see Sugoroku as a young man. Mahou Sensei Negima! : Negi Springfield inherited his father's spiky red hair. In Metal Fight Beyblade, Gingka and his father have the exactly same hairstyle, even with matching headbands. However, his father's hair is a darker red. Tengen Toppa Gurren Lagann: The Parallel Works 8 video shows that Lordgenome as a child had the same Multicolored Hair as his daughter Nia, and in the same style as when she had it cut short (as opposed to now, where he has no hair at all). The Armstrongs in Fullmetal Alchemist all have blond hair with a distinctive curl in the front. Edward and his father Hohenheim both have the same shade of blonde hair that they both wear in a very similar style. Yaiba seems to have inherited his hair from his father. In Nichijou, Nakanojou and The Daifuku Guy have mohawks. Shobu's Disappeared Dad in Duel Masters shares his absurdly big Anime Hair. Asem, the second-generation protagonist of Mobile Suit Gundam AGE, has a more masculine version of his mother's short haircut + ponytail. In Marginal Prince, Joshua's hairstyle is exactly the same like that of his father, with the color of his mother's hair. At the same time, it looks identical to that of his ancestor, King Alphonso. And then there is Henri, whose hair has the exact same color and style (including length) as his dead mother's. Komachi from Yes! Pretty Cure 5 sports an identical hairstyle to that of her older sister Madoka (no, not that Madoka). Also, to a certain extent, all members of the Kurumi family sport wavy hair. The Lyrical Nanoha franchise has an adopted child version with Vivio, whose Older Alter Ego shares the same side-ponytail hairstyle as her Nanoha-mama. She'd wear it in child form too if she could, but the Magical Girl Lyrical Nanoha Strikers manga showed that all that concentrated hair causes her to tip over to the side. However, Vivio has the same Girlish Pigtails as Nanoha when she was a child. Chrono and Amy's kids inherited Amy's Idiot Hair. Fate's hairstyle during Force is basically a hybrid of her mothers', resembling pre-insanity Precia from the front with Lindy's pigtail in the back. Naruto basically has the same hair as his father the Fourth Hokage, but got his face from his mother. Similarly, Boruto takes his looks after his father (Naruto), but got his face from his mother (Hinata). Rock Lee and Might Guy as well, but Might Guy isn't actually Rock Lee's father. Il Sole penetra le illusioni: Akari and her mother Hinata don't have the exact has hairstyle, but they both have this odd hair-crescent thing. It sounds weirder than it looks. In Katekyō Hitman Reborn! Tsuna, apart from inheriting the same powers, also has the same hairstyle as his ancient predecessor Giotto. Lucky Star: Konata and Kanata Izumi also are a clear example of this trope; not only do they have the same hairstyle but they also share the same hair color. Well, with the exception that the daughter additionally has the ahoge. Kagerou Project: All of the gorgons (Azami, daughter Shion, granddaughter Marry) have the same hairstyle - wavy Rapunzel Hair, which sits separately, like snakes - with some slight variation (mainly Shion, who lacks a fringe). The snake-like appearance of their hair is actually plot-relevant, as it's how the villagers identify them as 'monsters' and justify attacking them. In Gourmet Girl Graffiti, females from the extended Machiko-Morino household (Ryou, her mother, her aunts Akira and Kirin's mother and Ryou's grandmother) all have brown hair and curls that looks like downplayed Ojou Ringlets. Space Patrol Luluco: Downplayed with Luluco, as her hair looks like a tamer version of her mother Lalaco's hairstyle. Played much straighter when she becomes Ms. Trigger, with even her hair color changing to match. Infamously, the Osborn family of Spider-Man (seen above), who all have the same... "unique" hairstyle (stylized waves?). The one exception is Gabriel Stacey, the son of Norman Osborn and Gwen Stacey, and even in that case, it's likely because his father was originally intended to be Spider-Man himself. Spider-Man has a mother-daughter example in Gabriel's sister Sarah; apparently black hairbands are genetic. Apart from the arguable quality of the story that introduced them, this may be part of the reason fans are hoping for a Retcon. 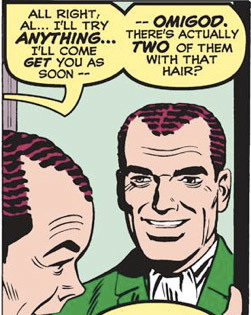 Spider-Man: Chapter One retconned Sandman into being Norman Osborn's distant cousin, solely because they had the same hairstyle. Harry later decides to shave his head so he can safely get off the grid after cutting all ties with Norman following the American Son debacle. Impulse's hilariously big, poofy hair comes from his mother, Meloni. Axis Powers Hetalia fanfic Kaitō Kokoro : Two of Kiku's and Feliciano's children pretty much inherit their hair colors and hairstyles. "...Sure." The elder sibling took two of them, emerald hues filling with wonder as he took in their sleeping forms. "They're...beautiful." Jade depths turned, glancing upon a boy who had locks styled like the father's, eyes revealing to be the same limpid brown of the mother's as they opened. "So this one's name is Nihon, right?" Those same jade depths switched to the second bundle, the other another boy who had brunet hair like his mother's and the same piercing ebon orbs as his father's. "And this one's name is Ren, right?" In The Book of Life, as seen in his dad and grandfather, Manolo has the "Sanchez curl". Notably, the same curl is also present in the locks of hair hanging by Maria's eyes, which signifies that "she has eyes only for Manolo". His mother also has curly hair - really, curls are something of a continuing motif in the film, both in hair and in general design. Meet the Robinsons: The Robinsons all have exactly the same flick in their hair, even most of the women. Frozen, Elsa (at least, once she's an adult) and her mother both wear their hair in the exact same braided bun, at least, until Elsa lets her braid down and rumples her bangs up a bit during the "Let It Go" sequence. Her hair stays down for the rest of the film. Harry Potter got his jet black messy hair from his father, James, as part of an overall Strong Family Resemblance. This made his relationship with Professor Snape, who passionately detested James Potter for several very good reasons and at least one not-so-good one, strained at best. The Heap family in Septimus Heap all share straw-coloured curls. Likewise, the royal family all has long black hair. Emperor Uriel Septim VII and his illegitimate son (or should we say... heir?) in The Elder Scrolls IV: Oblivion bear some facial resemblance, but have the exact same hairstyle despite having never met (there are only a limited number of hairstyles available to begin with, but it does help you get the feeling they're related). But it gets better in light of one popular fan theory: it's possibly a hint that the Prophet in Knights of the Nine is Tiber Septim, a.k.a. Talos himself. In Disgaea: Hour of Darkness, Laharl's father, King Krichevskoy, had the same long Hair Antennae that he does, only his ended in Regal Ringlets. Laharl's sister Sicily also has them, but she ties it up in a bow. In Apollo Justice: Ace Attorney, brothers Kristoph and Klavier Gavin both have the same, long spiral side ponytail.. thing. Klavier's collar hides whether or not the rest of his hair is long, but if so, the two would be identical but for fashion, despite not being twins. However, Klavier had short hair in sprites from when he was younger. In Metal Gear Solid 4: Guns of the Patriots, Raiden's son John has his father's white feathered hair. In Phantasy Star III, any offspring/descendents of Rhys (with the exception of Crys, whose hair seems to be a strange combination of both his parents) will have the same hair as their respective mothers. They're Bird People, so it's not hair exactly, but The Legend of Zelda: Breath of the Wild has Tulin, a Rito boy with the same spiky white tuft of feathers on his head as his father Teba, albeit not nearly as long. Homestuck: the kids have very similar hairstyles to their guardians, and, of course, each other. In Girl Genius, Gilgamesh Wulfenbach has the same unkempt frizz and traditional Mad Scientist look as his father Klaus. If Word of God is to be believed, this also explains why Zeetha has spiky bangs when the rest of her hair is straight like her mother's - she and Gil are fraternal twins. A number of the Valois family have the same unusual shade of red hair - Tarvek, Violetta, Martellus and Xerxsephnia, and presumably also Aaronev, since someone mistook Tarvek for a younger version of him. Stand Still, Stay Silent: Emil and one of his young cousins both have a hairstyle near-identical to the one their grandmother is shown wearing as a child in the prologue and as an adult in her family tree portrait. In the American Dad! episode "The Kidney Stays In The Picture", it is revealed that Francine slept with another man right before her and Stan's wedding, meaning Hayley may not be his biological daughter. The one thing Haley and this man have in common? A bandana. Upon her introduction, it is clear that Marge gets her iconic beehive from her mother. In the "Treehouse of Horror XXIII" segment "Bart and Homer's Excellent Adventure", Bart finds that he's changed history so that his father is Artie Ziff, and removes his hat to find that his spiked hair has been replaced with Artie's hairstyle (but still the same shade of yellow as his skin). He turns round to find the same thing has happened to Lisa and Maggie. Sideshow Bob's pineapple-shaped hairstyle is shared by both his son and his mother. The Flanders siblings have afros like their mother Maude. The Fry/Farnsworth family in Futurama. Philip J. Fry's brother Yancy had the same weird points in his hair. Their mother had the same style only longer. So does her late father-in-law Enos Fry [only shorter], which doesn't really make sense, especially since he's not actually Fry's grandfather anyway. Fry's nephew Philip J. Fry Jr inherits his father's hairstyle as does Professor Farnsworth (Fry's great-to-the-thirtieth-nephew) in flashbacks to when he had hair, and the Professor's clone, Cubert. Yancy and Philip Jr. had brown hair; the rest are all redheads. Voltron: Legendary Defender: Downplayed. Keith and his mother, Krolia, both have the same in-the-face bangs. Further more, Matt and Pidge have very similar haircuts. When we see Allura's mother in flashback and see that she had the exact same Mystical White Hair as her daughter, though she wore it slightly differently. Although this trope is an obvious exaggeration, it does have a real life inspiration. Your hair color is hereditary, as is baldness and body hairiness, the shape of your hair follicles (straight, wavy, or curly), and the way your head hair grows (clockwise or counter-clockwise). It is thus possible that the same hairstyle that suited best one of your parents will also suit you best, if you have inherited most of those features from them. They may also have taught you to cut your hair in the same way and you never changed it.